Beautiful Champagne glasses should be more than just a sight for special occasions. They make a fine display for a dresser or a cabinet, with their intricate, delicate design. But, whether you plan to put them to regular use or save them for very special occasions, we’ve put together a guide to help you choose the best Champagne glass for you. Unless your Champagne is particularly aged, a flute is the best champagne glass. Its narrow shape encourages the carbonation of the wine, helping it to stay fizzy for longer, which is perfect for when you’re sipping slowly over a long evening. Brut and extra brut wines need the fizz so they remain palatable, but flavoursome fizzies like Rose Prosecco and particularly aged champagne are best served in a tulip glass so the aromas have more space to mingle. According to wine experts, the wider the rim diametre, the better we can smell the wine’s aroma, which makes our top pick, the Waterford Lismore Toasting Flutes, particularly favourable for Champagne and prosecco. If we are to go into the finer details of choosing the best Champagne glass, the material of the flute can make a difference to the tasting experience. Many people prefer crystal glasses because the strength of it allows for a thinner rim however, for budding wine connoisseurs, making sure the crystal is lead free is essential. Aside from the shape and composition of the glass, the design should also be considered, especially if you’re looking to keep your champagne glasses on display. Again, our top pick, the Waterford Lismore Toasting Flutes, are intricately decorative, featuring the world famous diamond wedge cuts for that slice of authenticity. Coupes are a vintage alternative; their shallow glass shape disperses the bubbles, allowing you to taste the flavours of the wine, which is perfect for those with a sweeter taste. With everything in mind, we’ve sourced the best champagne glasses from renowned department stores Selfridges, House of Fraser and John Lewis. Offerings from designers such as Vera Wang feature, but traditionalists really can’t go wrong with a Waterford. With their beautifully traditional Lismore pattern design, these flutes are perfect for toasting and displaying in a cabinet. Whether you’re searching for a wedding gift or the perfect Champagne glasses for a momentous occasion, these clear crystal glasses are worth the expense. They feature a wide neck for smelling the full aroma of your wine, but they may not be as effective at keeping your champagne carbonated as thinner glasses on the list. This classic glass is, according the Selfridges, the perfect glass for sipping classic Champagne. The flute nature of the glass ensures the bubbles remain for as long as possible, while the fine rim ensures the wine is sipped seamlessly, with the flavour unhindered by the glass. Naturally delicate due the crystal nature of the glass, the short stem should provide additional stability if being balanced on a tray. While these days Champagne saucers are largely associated with very strong cocktails, they were originally designed for medium and sweet fizzy wines, as the saucer shape of the glass disperses the bubbles so the drinker experiences more of the flavour. With their long, slim stem these glasses are incredibly elegant and as they’re made from glass, have a stronger composition than crystal. If you’re looking for a Champagne glass that could also serve you well on cocktail evenings, you really can’t go wrong with this set from House of Fraser. Experts suggest that crystal containing lead can tamper with the taste of the Champagne, so to experience the flavour of the wine in its true form, lead-free crystal glasses are the best. Featuring a long slim flute, Waterford explain that the glass will guide the bubbles to the top of the glass, releasing the flavour where the taste buds are more sensitive, which makes these Champagne trumpets for the best for appreciating fine sparkling wines. Champagne flutes are a traditional wedding gift, and not only mark your loved one’s special day, but can be used in the future to celebrate other momentous occasions. With a fine crystal flute and silver plated stem, these Champagne glasses are anything but ordinary, and with the Vera Wang influence, are beautifully stylish with fine embellishing, ensuring your gift is one of the finest on the table. 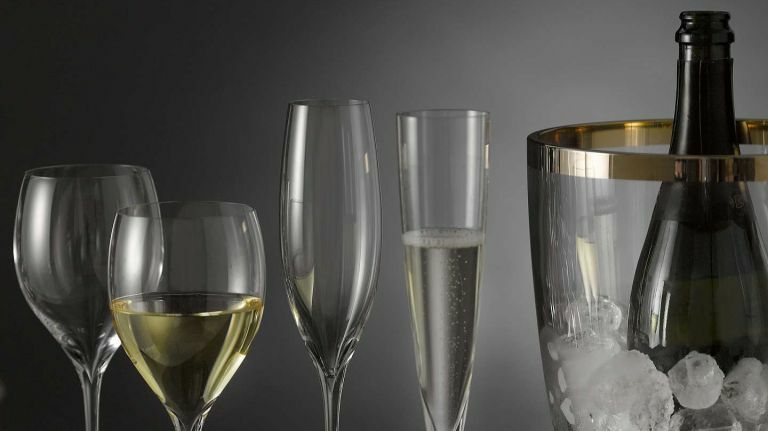 With a unique platinum painted base, these slim, elegant champagne flutes make a unique, or slightly unusual gift idea. Priced with an RRP under £20, they’re incredible value for money, yet are still made from crystal. These glasses are part of the larger Bellagio collection, and are the perfect gift idea when the next occasion comes round. When the girls come over for a natter and a bottle of wine, it’s nice to have a set of funky glasses you can put the world to rights with. Made from glass, these funky Champagne flutes are sturdy and feature a fairly large holding capacity of 250ml, perfect for when a drink is well needed! From the aptly named Mikasa cheers collection, funky white wine, red wine, martini and cocktail glasses are also available to buy, bringing a whole new element to fun Friday nights in. Always have a bottle at the ready with our list of the best freestanding and under-counter wine-fridges.